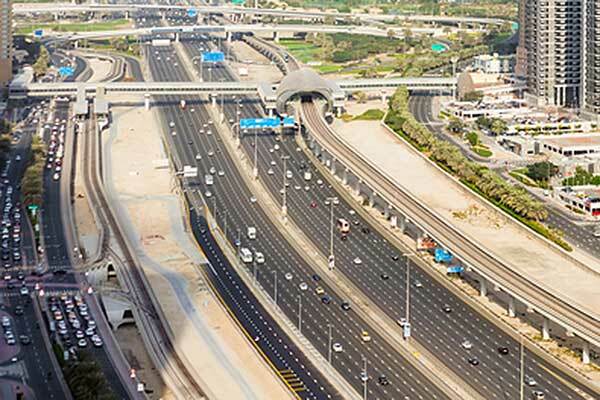 The Dubai Roads and Transport Authority (RTA) and the Dubai Police General HQ said that the trial run of the Traffic Incidents Management Scheme would be applied to a 70-km sector of the Sheikh Mohammed bin Zayed Road for one year starting from September 16. The step aims to ensure rapid deployment for clearance of vehicles involved in traffic accidents and vehicles breaking down on roads. The ultimate objective is to streamline the traffic flow at the sites of accidents, cut short the time taken to remove crashed vehicles and fend off secondary accidents triggered by sudden snarls. A coordinative meeting was held between Mattar Al Tayer, director-general and chairman of the Board of Executive Directors of RTA, and Major-General Abdullah Khalifa Al Marri, Commander-in-Chief of Dubai Police, in the process of Major-General Al Sallal Saeed Bin Huwaidi Al Falasi, director of Administrative Affairs. The meeting discussed means of boosting bilateral cooperation, expanding the Intelligent Traffic Systems, and collecting fines applicable to vehicles whose registration had expired. The step will improve the standard of services offered, and utilise most resources and technologies to upgrade the infrastructure and maintain Dubai’s global profile. The two parties agreed to implement the trial operation of the Traffic Incidents Management Scheme, which will commence on the Sheikh Mohammed bin Zayed Road as of September 16 this year. The service will be provided as per international best practices. The two parties have agreed to deploy a team at the Command and Control Room of the Dubai Police. A process will be charted out for communication between the Operations Room, Traffic Control Center and dedicated patrol vehicles on the E311 Sheikh Mohammed bin Zayed Road. According to studies commissioned by RTA, the scheme will help to reduce congestions along with associated costs by as much as 25 per cent, and save extra expenses incurred by Dubai Police as well. It will step up Police traffic enforcement measures, cut the time needed to remove damaged vehicles off the road, detect the occurrence of accidents and incidents, and ensure rapid deployment before building up the snarls or the incidence of secondary accidents. It will enable the delivery of roadside assistance to faulty vehicles to clear them off the road, and coordinate with motorists to remove their vehicles instantly. Through this Scheme, RTA is seeking to provide assistance for the management traffic accidents by traffic diversion to alternative routes and making local traffic diversions among other measures. The meeting discussed the expansion of RTA’s Intelligent Traffic Systems, which envisages the designing and building of an integrated infrastructure of Intelligent Traffic Systems and the building of a new Traffic Management Control centre at Al Barsha. It entails broadening the coverage of the Intelligent Traffic Systems from 11 per cent to 60 per cent of roads network in Dubai and speeding up the detection as well as response to accidents and snarls on Dubai roads. It seeks to provide real-time traffic information to the public about the conditions of roads network through new Virtual Messaging Signs & smart apps and enhance the efficiency of traffic management at mega event sites, such as Expo 2020. The two sides also discussed the collection of fines on vehicles with expired registration, the number of which is estimated at 269,000 vehicles. It has been agreed to intensify enforcement of measures along with the issuance of offences online, carry out more awareness campaigns to highlight the serious outcomes of failing to renew vehicles registration and continue driving them. Discussions also covered accidents of bikes and efforts of Dubai Police to enforce the rules against offenders including the impounding of bikes in breach of the Use of Bikes in Dubai Law. It was reported that about 1,700 bikes had been seized in Dubai in 2017. The meeting also discussed the Dubai Traffic Safety Strategy and the importance of raising the traffic awareness of road users. Al Tayer hailed the strategic relationships between RTA and Dubai Police and their cooperation in managing traffic movement and enforcement. He also praised the coordinative meetings between the two parties as they offer a direct communication channel for discussing new business that serves the interest of citizens and residents of the Emirate.